To initiate this “Big Sort,” Environmental Defense Fund (EDF) teamed up with a group of experts in technology and nutrient management to develop NutrientStar, which helps farmers determine which products deliver on their promises and are worth the investment. NutrientStar is an objective third party program that compiles data on nutrient use efficiency results, giving farmers an alternative to company marketing materials in their search for tools that apply nutrients at the right source, rate, time and place. 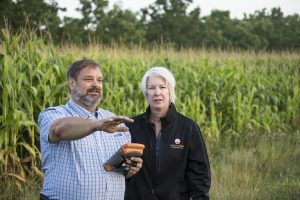 It lets farmers know which products have been tested on which crops, where products were tested, how much research was available, and what the impact was on yield, fertilizer efficiency and profitability. The compiled data is sourced from scientific studies performed by universities, company-supplied field trials and NutrientStar’s own on-farm research trial network, which conducts 40-60 independent trials per year. The Technology Extrapolation Domain framework ties regions together based on key growing conditions, not geographic proximity. Even when information is available, farmers need to know if a product will work in their specific soil and climate type. So NutrientStar collaborators developed a new geospatial feature called the Technology Extrapolation Domain (TED) framework. The TEDs help filter trial results according to agronomic conditions rather than geographical distance; a trial conducted hundreds of miles away may still have relevance to a farmer even if it wasn’t conducted nearby. This makes NutrientStar information more relevant to tens of thousands of additional farmers across the Corn Belt. Using the TED framework, farmers can see other regions that have the same long-term weather and soil conditions as their area, and where the tool in question has been tested. Stakeholders throughout the agricultural supply chain, from food companies to grower organizations, find value in NutrientStar. Most important, farmers do as well. Here’s what farmers in Ohio, Michigan and Indiana are saying about NutrientStar. NutrientStar is constantly evaluating new products and expanding the geographies its data covers. The NutrientStar team is putting out an open call for additional user feedback. Is there a tool you are interested in trying that NutrientStar should prioritize for review? Are there other ways to make the program more useful to farmers? Please share your feedback. To learn more, please join EDF and the American Society of Agronomy for a webinar on December 5, 2017 – Does your fertilizer management tool deliver benefits? A new assessment program finds out. This entry was posted in fertilizer, Sustainable Agriculture and tagged fertilizer optimization, field trials, Indiana, Michigan, nutrient management, nutrient use efficiency, NutrientStar, Ohio, on-farm research, precision agriculture. Bookmark the permalink. Both comments and trackbacks are currently closed.